Plan, Download, Print/Share, Use Offline! BY backpackers FOR backpackers. This free app is fully functional with additional premium options for the serious backpacker. Downloaded, high resolution maps are still available for use even after your subscription expires! Using a power optimized GPS mode, Topo Maps+ saves on battery life for long-lasting offline access to GPS tools deep in the backcountry. Topo Maps+ offers both subscription (no auto-renew) access to premium maps & features as well as the ability to purchase individual maps from National Geographic and Canada’s Backroad Mapbooks. 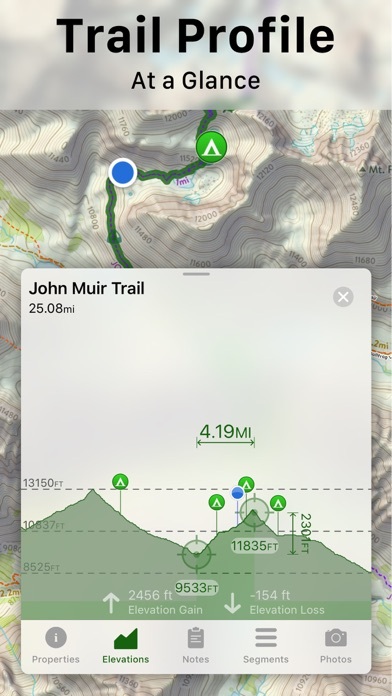 With Topo Maps+ you can: *Plan your next hike *Download maps for offline access *Print high quality custom maps *Record your track PLAN * Download maps for use offline. * Easily trace routes to find approximate distance between locations. * Add waypoints to maps. 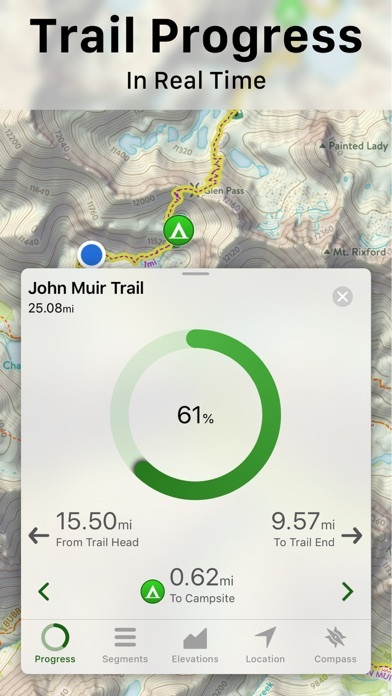 * Print, email or share maps * Trace over a trail on a topo map and then visualize that trail with the MapBox terrain and satellite maps. *View you current location on a topo map even when you are days from the nearest the cell tower. 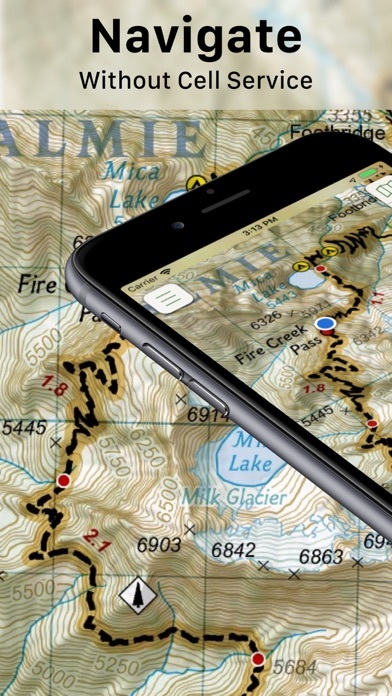 * Use the GPS and compass on your iPhone to see your current location and to align the map with the direction you are looking even without an internet connection. 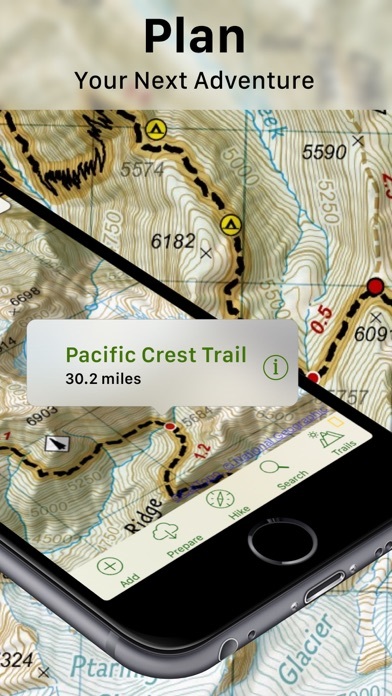 DOWNLOAD MAPS Easily download USGS, US Forest Service, MapBox, NRCAN/GEOBC, Thunderforest, Satellite maps and MORE, so you can use the maps offline while deep in the backcountry. MAPS * Detailed USGS 7.5 minute topo maps for the USA. 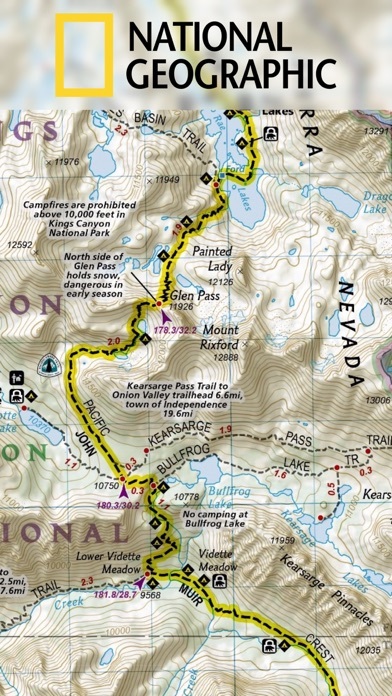 USGS topo maps are the ultimate map for hiking, backpacking, mountain biking, and other outdoor activities. They have the details you need while in the backcountry. * Detailed USGS 7.5 minute topo maps with stunning relief shading for the USA. 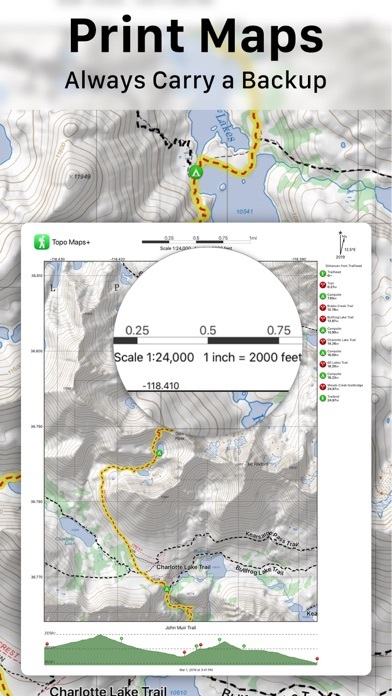 This makes the USGS topo maps much easier to read and use. * NRCAN/GEOBC topo maps for southern and western Canada. * Thunderforest outdoor map has contour lines, trail, and outdoor features for the whole world. 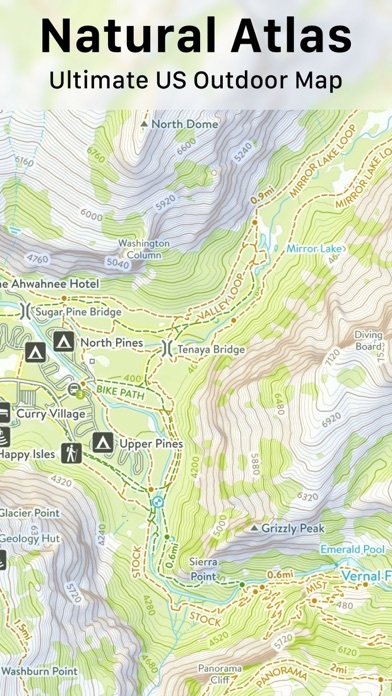 * Glacier Topo map has world wide hiking and biking trails. * MapBox Terrain is a beautiful elevation and land-use layer for the entire world, visualizing hills and elevation contour lines. * MapBox Satellite offers highly-detailed imagery for the whole world. * MapBox Street map is an ideal map for urban use and getting to the trail head. * New Zealand Topo Maps from LINZ. 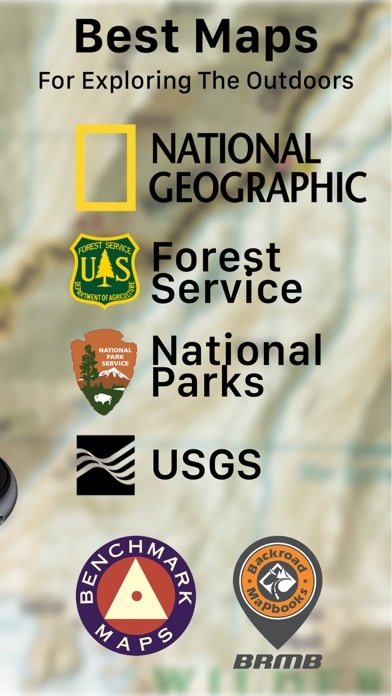 * US NOAA Marine Maps * Partial US National Park Visitor Maps * Partial US Forest Service Maps * NeoTreks (with Pro) * Natural Atlas (with PRO) PRINT/SHARE * Custom Maps not constrained to quadrants * Include your routes, waypoints, elevations and more. Share your custom maps with your party or leave one behind for loved ones to know where you will be * Share routes, trips, and waypoints with your friends. Share custom map images * Save your routes, trips, and waypoints into categories * Export routes, trips, and waypoints to KML & GPX files to use in other apps. Import routes and waypoints from KML or GPX files. Photo overlay (with Pro) - automatically tag photo waypoints Always take a hard copy map with you! SUBSCRIPTION LEVELS FREE: Download Maps, Sync Data, Folders, Trace Routes, Elevation Profiles, Waypoints, Record Hikes, Print Maps, Export Data, Import Data, Share Data Map Pass: everything above plus high resolution downloads Pro: Everything above plus the Natural Atlas and Neo Treks maps, Larger area Downloads, Progress Along Trail, Trail Segments, Custom Routes, Photo Overlays, Map Overlays, Grid Overlays, Data Overlays, Edit Tracks, & Routes, Regions APPLE WATCH View your offline maps and current location just by glancing down at your wrist. You no longer need to pull your iPhone out of your bag to check your position. CLOUD Sync your routes, trips, subscriptions, and waypoints between all of your iOS devices. Great app for when you are hiking in places where there is no coverage. 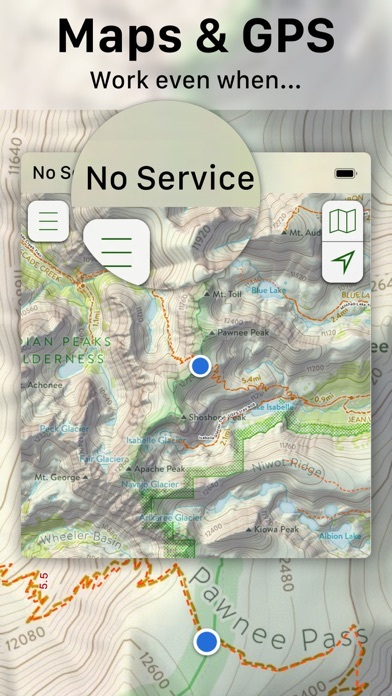 There are too many reasons to list why I think this is the best app for hiking in the backcountry. But here are a few: Excellent maps to download . Easy to plan and follow your custom routes. Offline downloaded maps. Low battery usage. Customize your routes with colors and icons. I have used this application across a wide range of use from Military use in terrain evaluation and movement. To personal hikes to get to prominent locations. 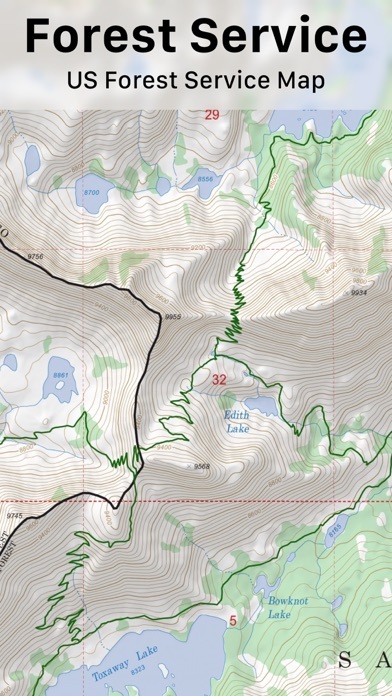 I have continued to be impressed by the quality of service from the Topo Maps+ team. I also am thankful for the commitment to Service members and their families. They have so many great features from hunting use to national parks I have used Topo Maps+ in states ranging from Washington, Utah, Alabama, Florida, Idaho, Montana, Colorado, Wyoming, and Arizona I have tested and used this application. It has yet to fail me in any standard from up to date maps, inputting various coordinate systems, and navigate the land from both my mobile platform and from my Mac with trails and roads easily viewable. I have used other apps but none that have my loyalty and use like Topo Maps+. I have used this application for over a year and depend on it weekly in career and personal use. It’s worth your consideration.